Author. Explorer. Tea Drinker. Tarot Enthusiast. Banned Books Week starts this weekend and libraries and bookstores across the country are planning lots of fun events. I’m thrilled to tell you that I’ll be visiting readers in two locations next week: Indianapolis, IN and Springfield, MO. If you live near any of these locations, please come say hi! I would love to meet you. But no throwing tomatoes. I don’t want to dodge any produce. You can, however, throw chocolate. Thanks to the wonderful, dedicated, book-lovin’ folks at the Kurt Vonnegut Memorial Library and the Springfield-Greene County Library District for making these visits happen! Update: The winner of the autographed copy of WHAT HAPPENED TO GOODBYE by Sarah Dessen is Angela Huang! Thanks for participating, all, and for sharing your heartfelt stories. 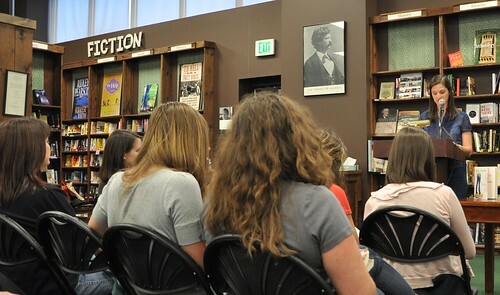 Just got back from dinner following an awesome event at Tattered Cover in Highlands Ranch with Sarah Dessen, on tour for her latest, WHAT HAPPENED TO GOODBYE! 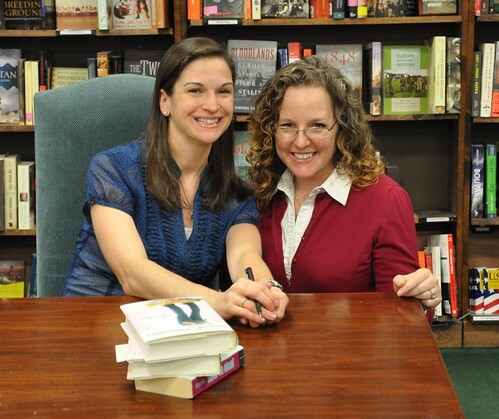 You all know about my Dessen-love from the early days, right? Well, in case you’re new around here, let me tell you, because it’s pretty simple. She’s the reason I write YA. Without her books, TWENTY BOY SUMMER and FIXING DELILAH wouldn’t exist. No, really. Her books THAT SUMMER and SOMEONE LIKE YOU, which were combined in the movie tie-in edition called HOW TO DEAL, were my first YA reads as an adult (because at the time, I was like, hey, two books for the price of one, with Mandy Moore on the cover? Sweet! ), soon followed by Laurie Halse Anderson’s SPEAK and Deb Caletti’s THE QUEEN OF EVERYTHING. After that, I knew I was born to write for teens. These lovely ladies are like my trifecta of fangrildom, and now I can honestly say that I’ve appropriately (or maybe inappropriately) fangirled all three in person. All that and I got to eat something called “adult mac-n-cheese” for dinner and bring home a whole container of chocolate chip brownies from my friend Meredith. Now I’ll spend the next two days reading Sarah’s WHAT HAPPENED TO GOODBYE, turing pages while alternately jamming brownies into my mouth. Do you realize what this means? That even if the world ends next Saturday like all those crazies keep saying, I can go out with a smile and a sigh, because my life will be complete. How can your life be so complete, you ask? Well, I can’t send you brownies, but tonight I snagged an extra autographed copy of WHAT HAPPENED TO GOODBYE for one lucky reader! 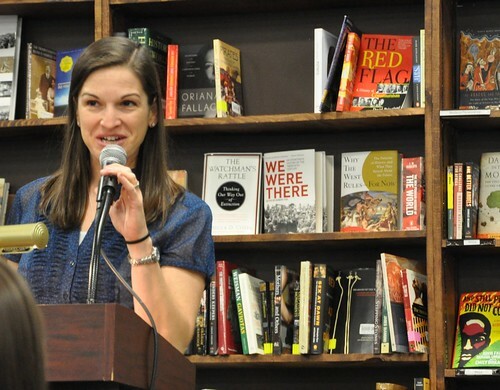 Thanks again to Sarah Dessen for being so gracious in the face of my nervous and possibly borderline stalkerish babbling, and thanks as always to Jinx, Mickey, and the wonderful staff at Tattered Cover who make reading and writing in Denver so impossibly great. Poet Michael Henry to Read in Buffalo: Join Me! Denver poet, executive director of Lighthouse Writers Workshop, and Buffalo area native Michael Henry is coming to town! Before I tell you the whole long story of why this is so exciting (because you know there’s a story, right? ), here is the event information. Consider this an official invite for all you Buffalo peeps to join me as Mike reads from his collection of poetry, No Stranger Than My Own, at Talking Leaves next week. Mike Henry is the reason I write young adult books. I mean, yeah, I know was born to do it and everything, but if it wasn’t for Mike, I don’t know that I would’ve found my way to the YA section in time to figure that out. Judy Blume aside, most of the books I read as a teen were the stuff of nightmares: V.C. Andrews, Mary Higgins Clark, Stephen King, Robin Cook, and the few adult romance novels I could sneak from the library into my room in a doubled-up Super Duper grocery bag. I’d spent my entire young life reading and writing everything but YA, hiding behind marketing communications jobs that skirted the edge of writing without forcing me to bare my creative soul in public. It was never enough, though. It was 2003. We’d just moved from New York City to Denver and, in keeping with the new beginnings theme, I’d promised myself I’d sign up for a writers workshop. I Googled “Denver writing groups” and stumbled onto an excerpt about growing up in Buffalo. The author was a Buffalo area native who’d relocated out west and co-founded Lighthouse Writers Workshop, an independent creative writing program in Denver. Well, you all know how I am about signs, right? Right. So I signed up immediately for Mike’s next class: a memoir and personal essay workshop. I was 27 years old. I was the youngest person in the class and, in my own opinion, had no business writing a memoir. I’d never done a critique workshop before. Never reviewed anyone’s writing and never willingly put my own out there for public response. All of the writers in that room were so talented, especially Mike, and he’d kick off each class with a 15-minute freewrite during which group members produced better stuff than I could cull from two decades of poems and journals. I lost a lot of weight that semester—I was totally on the nerve diet. On the day of my critique, I thought I might pass out. Maybe I did, and I just hallucinated the whole thing. Writers weren’t allowed to talk during their own critique, so I just had to sit there and take whatever came. Was I immature? Did I lack style and substance? Was I a no-talent hack? I held my breath and prepared for the attack. But the writers in my class—the ones I’d spent the first half of the semester alternately admiring and feeling unnecessarily intimidated by—were so supportive, encouraging, and amazing. They liked my stuff. They actually liked my stuff! Ugh. I dented and scratched up my car, and I nearly died (of embarrassment, anyway), all because someone whose writing I’d admired had complimented mine. Ah, the things we do for art! After class the following week, Mike pulled me aside to discuss one of my pieces—an essay I’d written recounting some trouble my BFF and I got into when we were fifteen involving some makeup and two power-trippy store security guards. He said the essay had a great teen voice and asked if I’d ever considered writing for young adults. Nope. I hadn’t really considered anything at that point—I just knew that I loved writing, had to write, would write anything. Mike told me that Lighthouse had a YA novel class with Jenny Itell starting up soon; he encouraged me to check it out. So I did. Four times in a row. Looking back on the night of the telephone pole incident, I like to think that Mike saw a lot of unrefined potential in me. A wayward writer with a natural talent and passion on the page—someone who just needed a little guidance to find her true artistic footing. Maybe he just saw me as a liability and wanted me out of his class. Whatever his motives, Mike set me on the path to YA literature—something I’d never before considered. In the Lighthouse YA class, I read Laurie Halse Anderson, Deb Caletti, Sarah Dessen. I wrote and revised. I read and critiqued. I practiced. Under Jenny’s guidance, I wrote Twenty Boy Summer, and I found my voice—my right place on the bookshelves. And the rest, says the movie voice-over, is literary history. It’s been seven years since the telephone pole incident and my first class at Lighthouse, and almost three since I last saw Mike. And now he’s coming to Buffalo, and I won’t miss it (or drive into it. Maybe I should walk, just to be safe)! I can’t wait for Mike to share his latest collection of poetry, No Stranger Than My Own, at our hometown indie next Thursday. If you’re in the area, please join me at Talking Leaves Main Street to show your support for this talented writer and artist. See you there! Ockler to Berk: You Lie! YA author Josh Berk, perhaps known best for his outrageous on-camera phone calls to medical professionals, clergymen, and others who probably can’t afford to be interrupted because they’re busy saving lives and solving the existential crises of our times1, exposed himself in front of hundreds of authors, teachers, and book industry pros on the floor of the NCTE conference this afternoon… as a fraud. Camera man Jon Skovron, author of newly released Struts & Frets, told authorities that he had no knowledge that Berk’s calls were fraudulent or that Berk was wanted for questioning in a series of author stalkings. Josh Berk was last seen entering a public transportation tunnel with fellow YA author Jennifer Hubbard (The Secret Year, January 2010), presumably to terrorize unsuspecting Philadelphia suburbanites. It is unclear at this time whether Hubbard is an accomplice or merely another victim of Josh Berk’s author-obsessed delusions. Residents are advised that Berk is armed with an old model Nokia cell phone and may attempt another fraudulent on-camera call without warning. 1. YA author Josh Berk is also known for his role as helpless victim – slash – martyr in the Great Ockler-Berk April Fools Caper of 2009 in which Sarah Ockler risked book sales to pose as a militant animal rights activist; his once prominent but now defunct Jewfro; and his debut YA novel, The Dark Days of Hamburger Halpin (February 2010). Hamburg Librarians, Readers, & Bulldogs Rock! Last night I had the honor of participating in the 5th Annual Family Read Night for Hamburg Middle School, my former junior high (yep, it was still considered a junior high way back then). The last time I’d been in the school, I was finishing up 8th grade more than 20 years ago. Events are difficult for me, no matter how many I do. It’s the public speaking part — especially with kids and teens, who are the toughest kind of crowd because they’re so honest. Deep down I’m still an introverted, awkward writer who does much better on paper than in real life. I get all crazy and nervous the whole entire day before any public appearance, and my poor husband has to resort to all sorts of trickery to calm me down. Last night was no different. I think I stopped speaking to him about two hours earlier so I could devote my entire brain to cooking up scenarios of me tripping on my way to the podium, me making inappropriate jokes to a roomful of kids and parents, me being booed out of the school, that sort of stuff. At least 2 out of those 3 things have never happened to me, but my mind still finds a way to freak itself right out before each and every speaking engagement. But soon after I arrived at Hamburg Middle School, I started to relax (or at least freak out a little less). Maybe it was the dedication of Hamburg Middle School’s library media specialist, Megan Moelbert, and the other librarians and teachers who worked so hard at the event. Or the amazing giant Twenty Boy Summer flag the students painted, which now hangs in my office (yes, this might be my favorite thing ever). Or roaming the halls and remembering the good times I had in junior high. 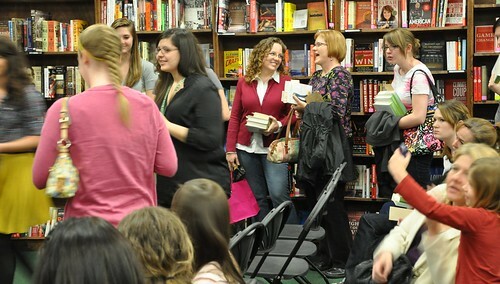 Or chatting with the enthusiastic librarian who was my elementary school librarian when I got to go on my E.T. “book tour” in first grade. Or the fact that my book got rave reviews from the Hamburg bulldog. Or the amazing awesomeness of all the teens and kids who stopped to chat with me after the presentation and filled the halls for an event dedicated to the love of reading. Either way, it was a wonderful evening in celebration of books and imagination and dreams, and I was so glad to be part of it, nerves and all! By the way, have you ever seen a cuter bulldog? I don’t think so! The Summer of Chasing Mermaids is now in stores! Exciting News for Fans in the UK & Australia! The Summer of Chasing Mermaids is Here! Get The Book of Broken Hearts on Kindle for $1.99! New Book Release! #scandal Has Arrived! Enter your email address to follow Sarah's blog and receive notifications of new posts by email. SarahOckler.com is a participant in the Amazon Services LLC Associates Program, an affiliate advertising program designed to provide a means for sites to earn advertising fees by advertising and linking to amazon.com.